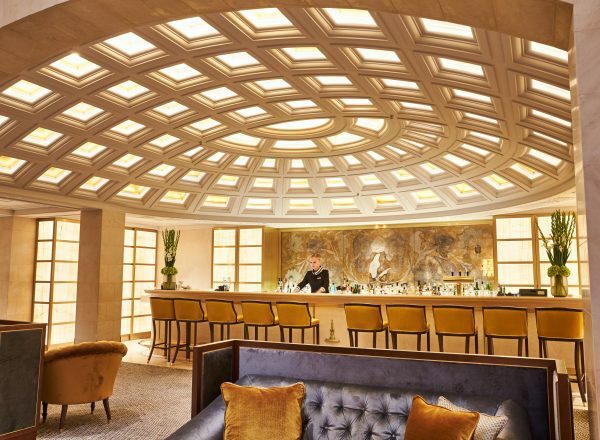 Within Berlin, a city that simultaneously invites visitors to inspect its tragic history and to wonder at its forward thinking art and culture, the Hotel Adlon Kempinski Berlin is a building that seems untouched by the swirling currents of the winds of change. Though there has been extensive modernisation since it opened in 1907, the hotel retains the opulence of a haven for the elite of early twentieth century society; in its golden age, which extended to the 1930s, it welcomed German and international royalty, as well as celebrities such as Henry Ford, Albert Eiinstein and Charlie Chaplin. Entering from the Unter den Linden, with the Pariser Platz and Brandenburg Gate mere steps away, there is no doubt that this hotel sits at Berlin’s historical and political centre, but the interior is immediately reminiscent of the grandest hotels in Paris and London, drawing inspiration as it does from the neo-Baroque and Louis XVI architectural styles. 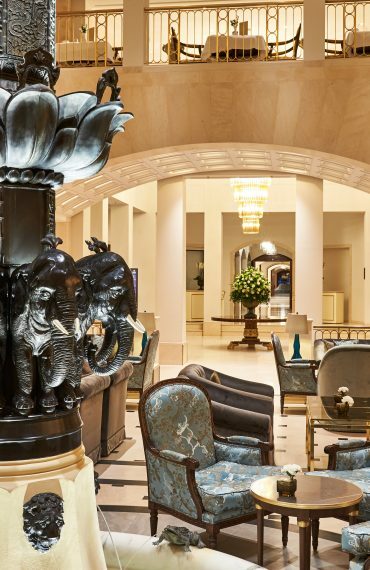 The lobby, with marble pillars and plush seating area, is dizzying in size – more than once during our stay I found myself at the opposite end to the one I had intended. Fortunately, the reception desk is clearly signposted and, just in case you do mistake one side of the lobby for the other, the worst that can happen is that you will instead stumble upon the bar… The staff at the reception desk were incredibly helpful in giving us some tips about places to explore for first time visitors and, within about five minutes, we were on our way to our suite. Following further twisting corridors on the upper floors did nothing for my internal sense of direction, but fortunately this was quickly resolved when we passed into our suite, continued through a small wood panelled vestibule and emerged into the main room, where the first thing noticeable was the incredible view of the Brandenburg Gate directly opposite our window. 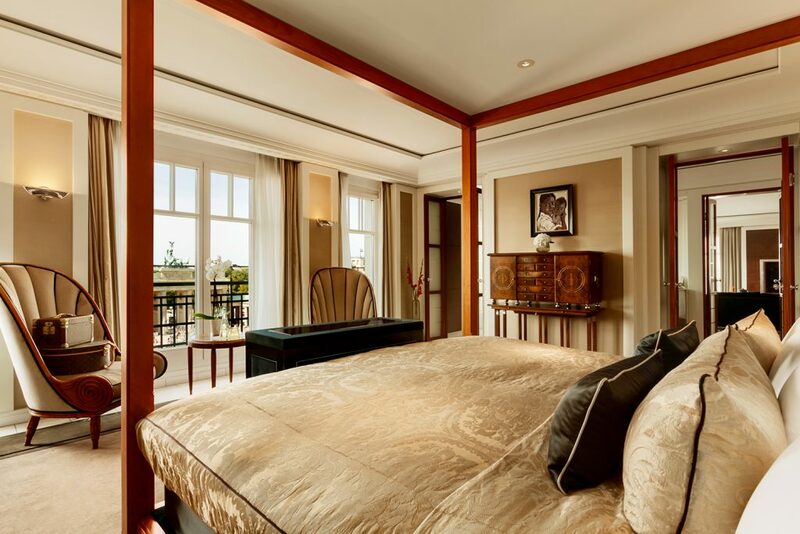 The Junior Suite Brandenburg Gate is sixty-two square metres of luxury space, but it is no word of a lie to state that I did not even see the bed for the first ten minutes, so captivating was the view from the window. In the late winter afternoon, lights were beginning to appear around Pariser Platz and there was a looming cloud that compounded the drama by threatening rain. 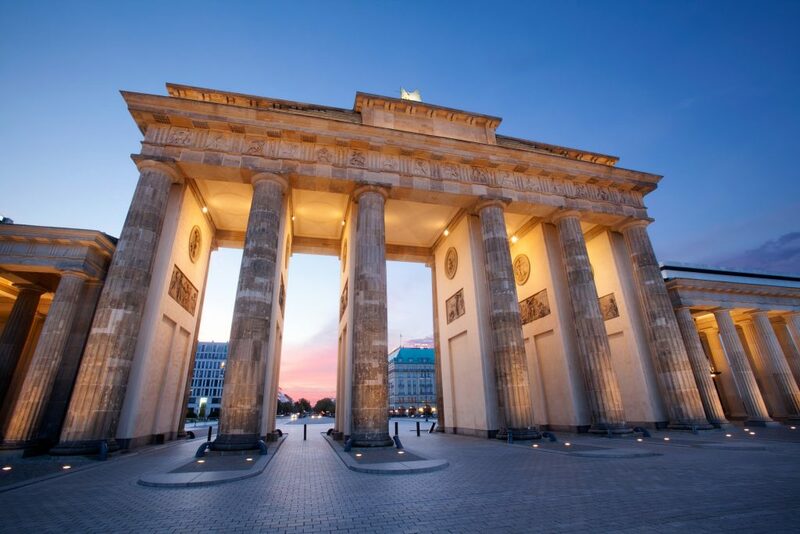 Berlin’s iconic Brandenburg Gate was dramatically lit from beneath and, from our vantage point, the bronzes atop the impressive structure were almost at eye height. Turning back to the suite, we found a second (smaller) Brandenburg Gate stood within our room in the form of a chocolate sculpture, so that even when the Gate was out of sight, we were constantly reminded of its presence! The classic décor of the room was stylish and comfortable, with a separate seating area (in which we immediately sat to pop a cork and toast our trip). The bed – as we discovered later – was enormous and very comfortable and the bathroom was elegant and well appointed, with his and hers sinks in adjacent corners so that there was space to wriggle our elbows while both preparing for dinner. There was also an entertainment unit where a large flatscreen TV was hidden and a writing desk in the centre of the room with a host of adaptors and sockets into which one could connect various devices. 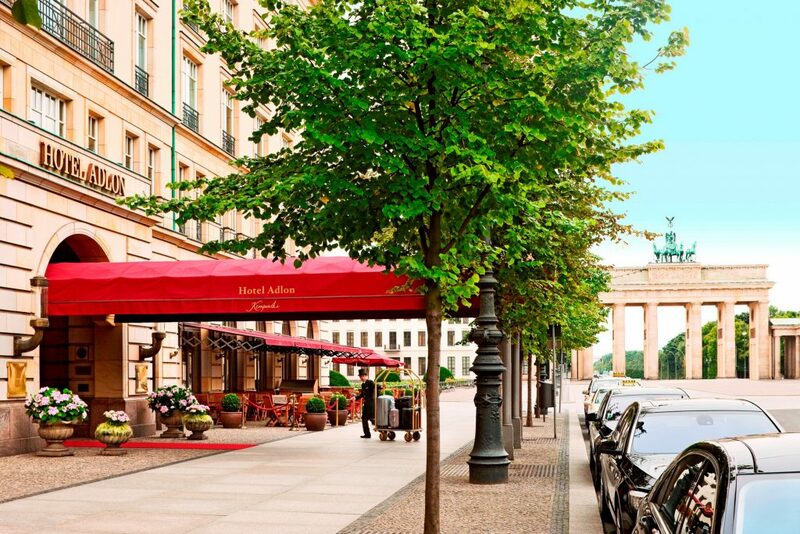 After a delicious dinner at the hotel’s two Michelin star restaurant, Lorenz Adlon Esszimmer (named after the original owner of the hotel), we slept well and awoke with the whole of Berlin waiting to be discovered. Breakfast was served on the lobby balcony, with an astonishing array of buffet items and hot food available; after a couple of strong coffees and the obligatory crispy bacon we headed out to take in some of the sights. 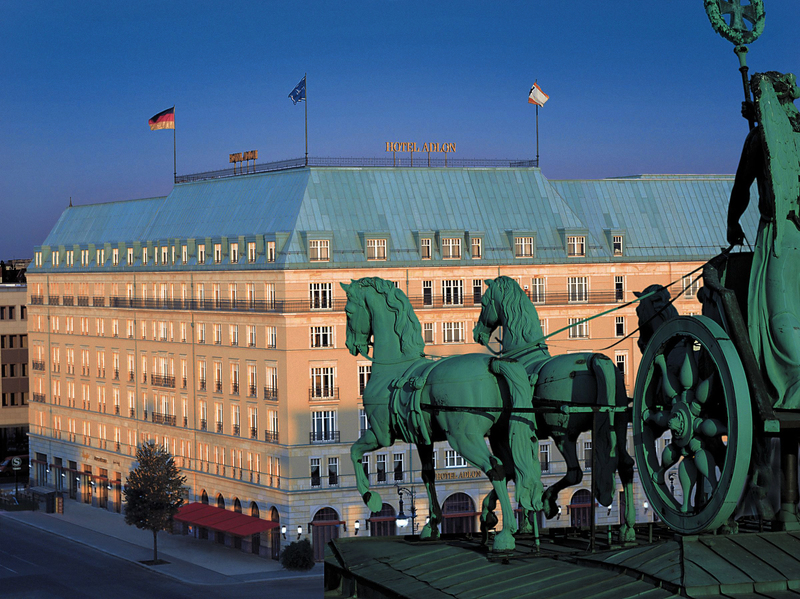 We were able to see a fair bit on foot from the centrally placed Hotel Adlon Kempinski. A brisk walk kept us warm as we headed south towards Potzdamer Platz, then went on to visit Checkpoint Charlie and the haunting Topography of Terror exhibition on the site of the former Gestapo headquarters. 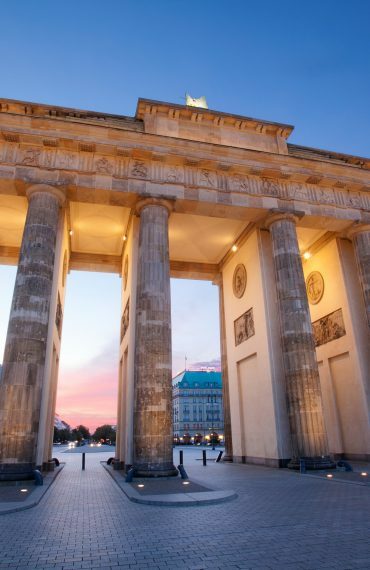 Berlin also has a nest of museums on a small island where ancient artefacts and enormous collections of art can be viewed within five minutes of each other. Public transport is very easy to negotiate in Berlin, so it’s easy to visit sights that are a little further than walking distance, such as the turn of the (eighteenth) century Schloss Charlottenburg, where the glamourous Sophie Charlotte, wife of King Friedrich I of Prussia, held court with some of the greatest thinkers, musicians and politicians of the time. 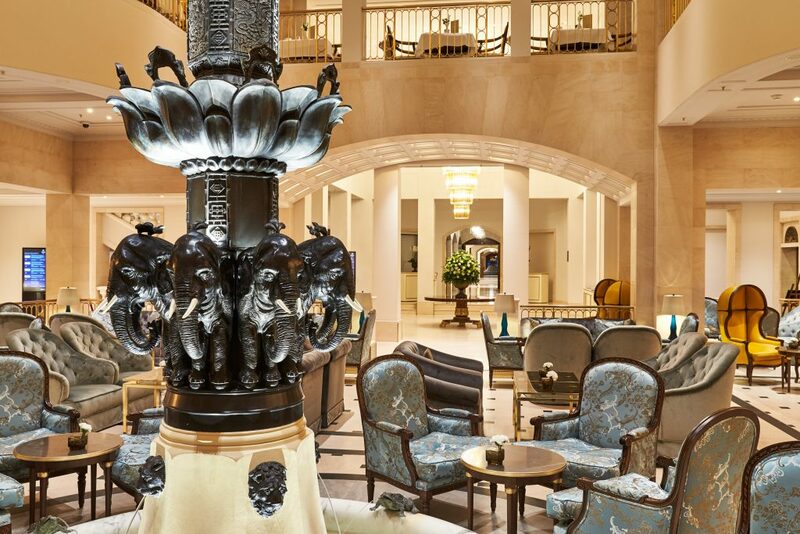 With so much to do and see, a visitor can end the day in much need of a rest and we were happy to find ourselves enveloped once more in the warmth of the Hotel Adlon Kempinski Berlin. We took advantage of the excellent cocktails available at the Lobby Bar and once more retired to our room to gaze at the grandiosity of the Brandenburg Gate, before getting ready to do it all again. 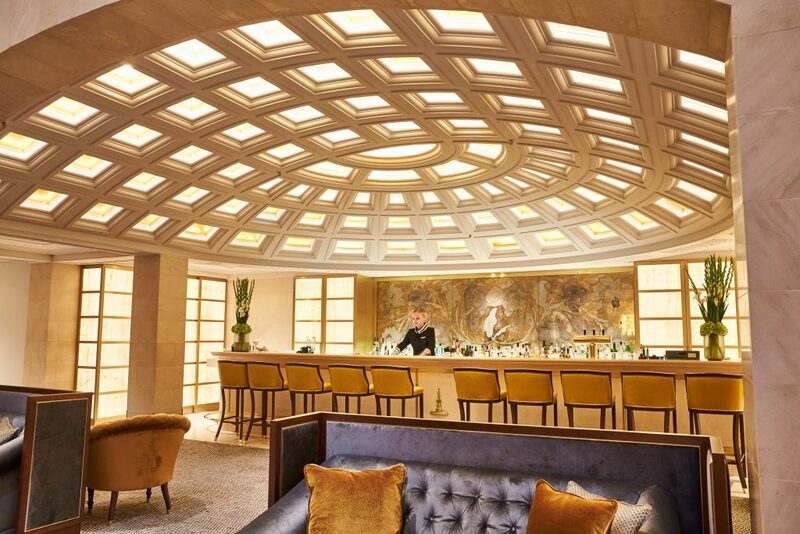 With its prime location and its timeless style, it is easy to see why this was – and remains – one of the most famous hotels in Europe; the evening illuminations of the Brandenburg Gate may seem as though they have been arranged exclusively for your enjoyment. 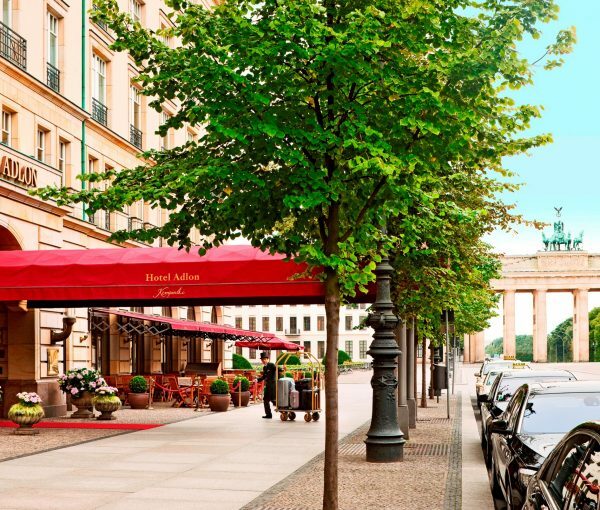 If you are looking for a hotel with a historic atmosphere and lashings of luxury, the Hotel Adlon Kempinski Berlin is an obvious choice.